I have to level with you, I live only a stone's throw from the Hudson River on the Upper West Side of New York, but my building is high enough above the water that some of the warnings about being in an “A” evacuation zone didn’t actually pertain to us (us being my neighbors and particularly, my flatmate). We basically chose to ignore the request to evacuate. The fact that there was no demand made allowed us to feel fine about it. I must admit that several times in the post-nightfall wind drama, I had severe doubts. The sound was amazingly loud, the tree directly outside my window looked like it was in agony, and the rain was, well let me just say: wild and pounding. And yet I was snug inside my own space with food in the larder, more bottles of spring water than we needed, and tons of Glade candles in safety glass waiting to replace my electricity. 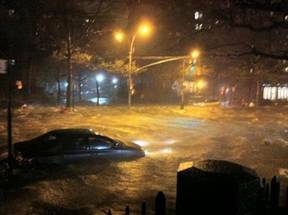 We never lost power, so after I’d checked in with my son, who’s a New Yorker, my daughters who don’t live here had checked in with me, and I’d spoken to everyone whose whereabouts I needed to know, I settled in and watched Sandy wreck and/or render dark familiar (and former) neighborhoods downtown. Eventually, I lit some of the candles for atmosphere, turned off the lights, tucked myself between my covers and spent most of the night dozing off and waking to watch the latest news about Sandy, and waited to see what would happen next. The next morning allowed me to see that my neighborhood had missed the big bullets and yet my heart ached for all of those, including some friends, who had not fared so well. The President spoke to the nation and politicians proclaimed that this was a national disaster, not a time to politicize what had happened. Sal, thanks for this thoughtful, as always, blog imploring us to act instead of speaking, Facebooking, or complaining. Following your lead I've enrolled as a volunteer on the Fema website, went for First aid and CPR training @ Red Cross yesterday and enrolled with them as a volunteer, and hope to spread the word that when our country needs us, we need to reach out to each other. Thank you for always showing the way. Thanks for this post. I hope people who are able can come together and help those less fortunate than themselves weather (!) this terrible time.